Here follows the lamentable but true story of a pro bono project gone awry. The project, which should have been embraced by the City of Brotherly Love, resonated with followers, supporters and members of the press, only to be squashed in the end by a mid-level bureaucrat in City Hall who had the power to reject it. I had been following the story of rising violence in my hometown since the last few months of 2006, when the total number of homicides in Philadelphia exceeded 400. Of the 406 homicides that year, an overwhelming majority (close to 85 percent) of them were committed with handguns. Though I actually live just outside the city limits, I still call Philadelphia my home. So when a national retailer with headquarters based here offered a glittery handgun-shaped Christmas tree ornament, my tolerance reached its limits and I decided to turn my anger into a positive statement and incite a different kind of call to arms. Taking a cue from Milton Glaser and embracing the title Designer/Citizen, I designed a public awareness poster as a plea to stop the senseless killing that had been going on in our city. The poster design would recognize the 2006 homicide victims—listing each name, age, race, date and method of death—and draw attention to this preventable epidemic. I wanted the poster to be displayed in bus shelters around the city. My interest in the bus shelter as a medium stems from two simple reasons: a 4-by-6-foot poster is relatively large scale compared to my usual work. Equally important, the bus shelter is truly “out there” in public for all to see. I like the fact—and the challenge—that whatever might end up on a bus shelter could be seen by practically anyone, a distinct design challenge compared to the one presented by knowing precisely who your audience will be. I partnered with the Anti-Violence Partnership of Philadelphia, a nonprofit agency that provides grief counseling to the families of homicide victims and educational outreach in inner-city schools. It is also a civic-minded institution just as concerned as I am that something has to be done. However, with absolutely no marketing budget, it became clear that we would need to raise the money for the production of the posters. Along the way, I contacted Monica Yant Kinney, a columnist for the Philadelphia Inquirer who had been covering in her columns the escalating violence. Yant Kinney was intrigued that a suburban guy like me would even care—enough to try to do something—about the city’s problem and in July wrote an article that addressed the matter. The article generated additional interest and offers of donations. Specifically, we received an offer of $1,000 as an in-kind donation for the digital printing of the large-format posters. We also received approximately $1,200 in anonymous cash donations from concerned citizens (including $1,000 from a single donor). This was enough to get the campaign started with several posters. I acknowledge that looking down the barrel of a gun is intimidating. That the poster has elicited this kind of response tells me that it has been (partially) successful. 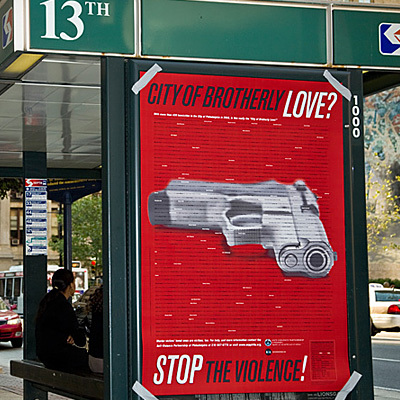 The poster was designed to grab attention—to stop the viewer in his or her tracks if just for a moment—to pause and think about the violence. It was intended to pay homage to the lives of 406 homicide victims, in the hopes of preventing even more. It was meant to make the viewer uneasy, as this is not pleasant subject matter—almost every day people are dying in our streets for no good reason. After running into this stone wall, I contacted Yant Kinney again and she wrote a follow-up article in August, which revealed that a bureaucrat in City Hall had the power to ding good work even when it was being offered for free. It’s a sad social commentary when it is easier to buy a gun off the street than to get an important, positive message displayed (properly) in bus shelters on the streets. This was meant to be pro bono work (as in pro bono publico, for the public good). Despite thousands of dollars in donated professional services on the part of the designer, the photographer and the printer—as well as the offer of in-kind donation for digital printing from the service bureau—we were still not able to get this call to action out on the streets where it needs to be seen. Curiously enough, all the donated services to produce the poster have come from individuals and/or businesses located in the suburbs—outside the city limits. But we all share a common hope, desire and plea to stop the violence in our city of Philadelphia. Ironically, now that the project has been written about in the newspaper and posted online, it has probably reached a wider audience (although a different kind of one) than was originally intended. More people have read about the project and have seen the poster (albeit on a far smaller scale) than would have seen the handful of posters that we tried to produce. I’m not so naive as to think that some bad guys are going to put down their guns and stop shooting each other just because they saw my poster on their street corner. But what can the average citizen do? Perhaps by raising awareness I could get people talking and thinking, perhaps even force those in power to do something about this urgent issue. The saddest thing about this whole story is that it will continue, as the number of homicides in Philadelphia in 2007 will most likely exceed the previous year’s. Meanwhile, I have found glimpses of Brotherly Love in those who stand with me on this cause, such as a local printer who has generously donated the printing of smaller-sized posters that could be more easily distributed. It may not stop the violence, but it’s a step in the right direction. Post script: As it turned out, despite early indications, the number of homicides in 2007 did not exceed the number for 2006. Having said this, I still think the problem persists and is in no way solved. Click here to post a comment on the AIGA national website.